The Australian and New Zealand Army Corps (ANZAC) was a First World Army Corps that was formed in 1915 and operated during the Battle of Gallipoli. A force of three Army Corps, consisting of a British Corps, a French Corps and a Corps of Australians and New Zealanders, known as the ANZACs, sailed for the Gallipoli Peninsula in south west Turkey. At 0400 hrs on 25th April 1915 the ANZACs were put into long boats to be landed at dawn at the lowlands behind Suvla bay. But a strong tide and current forced the boats to land facing steep cliffs and well defended Turkish positions. 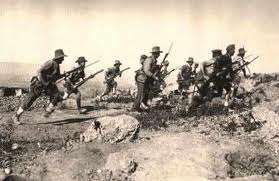 Despite taking heavy losses, the ANZACs fought with determination and outstanding courage, forcing the Turks to retreat. The ANZACs fought continuously and improved their position until the campaign was abandoned nine months later. Of the original force landed 66% were killed or wounded, but the morale of those fine men was never broken and they strongly resented being withdrawn. The news of the courage displayed by the ANZACs and the praise given them by the High Command soon reached Australia and New Zealand. Admiration and pride at the achievements of their soldiers fostered a new patriotism. Many Australians believe that Australia was born a nation on that bloody 25th of April 1915. ANZAC Day has been a national holiday since then, and Australians remember the men and women of all the Services who have fallen in war. The streets of every town and city in Australia and New Zealand are filled to watch the veterans march and to thank God that when the need arose their nations were able to call upon such support from its sons and daughters. Many units from the Australian Imperial Forces were housed in camps along the Wylye Valley during the 1st World War. The main camps were in Sutton Veny and Codford; 2 villages separated by only a few miles. 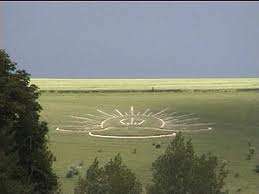 The Anzac Badge was cut into the chalk hill side which dominates the road (the A36) running along the valley bottom between Warminster and Salisbury. In recognition of their contribution to the war, this badge is still maintained today and can be seen from many miles away. Sutton Veny hold an Anzac Church Service on the nearest Sunday to Anzac Day in recognition of the Australian Imperial Force (AIF) and to all Australians who died in Sutton Veny during the First World War period.